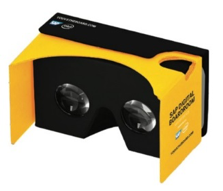 Free Google Cardboard VR’s and Your Chance to Win a Samsung Gear VR Headset at #SAPTechEd with SAP BusinessObjects Cloud! As we continue to innovate with SAP BusinessObjects Cloud, we‘re making it easier than ever to bring together data from both existing on- premise investments and new cloud data sources. 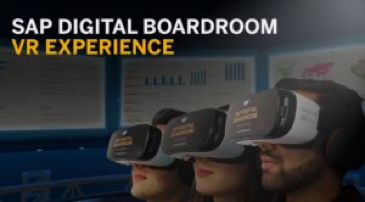 Come learn how businesses can make better decisions by integrating planning, business intelligence, and predictive tools together from the desktop all the way to the boardroom with SAP Digital Boardroom! Come visit us at the SAP BusinessObjects Cloud booths at SAP TechEd Barcelona. How Do I Pick Up My Free Google Cardboard VR? Remember, quantities are limited, so come find us ASAP! How Do I Enter the Contest for the Samsung Gear VR Headset? Everyone who participates is assigned a number for each entry. SAP will email the winner to let them know they won – make sure you check the email you used to register for SAP TechEd Barcelona. The winner must be able to pick up the prize at the Fira de Barcelona, Gran Via venue, otherwise a new winner will be chosen. MUST BE A REGISTERED SAP TECHED BARCELONA 2016 ATTENDEE THAT HAS COMPLETED ALL STEPS AT THE BOOTH TO ENTER OR WIN. (1) SPONSOR: SAP America, Inc., 3999 West Chester Pike, Newtown Square, PA 19073, is solely responsible for all aspects of the SAP Analytics Social Media TechEd 2016 Tweet Drawing. (2) ELIGIBILITY: SAP Analytics Social Media TechEd 2016 Tweet Drawing (the “Sweepstakes”) is open to individuals who are 18 years old or older at time of entry and attendees of TechEd Barcelona 2016. Employees of SAP or any of its affiliated companies (such as but not limited to SAP SE, SAP America, Inc., SAP Labs, Inc., and SAP Global Marketing, Inc.), and family members of any of the above (parent, children, siblings, regardless of where they reside) or those living in the same households of such employees (whether or not related) and any person in any way affiliated with or related to government entities, government officials or any other person or entity in the public sector are ineligible. This Sweepstakes is subject to all applicable federal, state, and local laws and regulations. Void where prohibited by law. (3) ENTRY PERIOD: The Sweepstakes begins at 11:30 AM Central European Time (“CET”) on November 8, 2016 and ends at 12:00 PM CET on November 10, 2016 (“Sweepstakes Entry Period”). 2. Sign into your Twitter account (“Account”) or, if you are not a member, become a member of Twitter.com for free and sign into your Account. Each tweet sent that meets the above criteria receives one (1) entry (“Entry”) into the Sweepstakes. Each tweet must be 140 (or fewer) characters. You must follow the Twitter Rules and any other content standards or requirements posted by Twitter. If your Twitter account is set to “protected mode,” your updates/responses will not be visible to Sponsor and, therefore, will not be received by Sponsor, resulting in your failure to participate in the Sweepstakes. Normal Internet access and usage charges imposed by your online service provider may apply. If you opt to receive Sponsor’s tweets via your wireless mobile device (which may only be available via participating wireless carriers), standard text messaging rates, airtime, and carrier charges may apply for each text message sent and/or received from your handset according to the terms and conditions of your service agreement with your wireless carrier. It is your sole responsibility to notify the Sponsor, in writing, if you change your Account. The Sponsor’s twitter account and related computer systems will be the time keeping device for the purposes of this Sweepstakes. (5) WINNER SELECTION & ODDS: All Entries must be received during the Sweepstakes Entry Period to qualify for the random drawing. On or about 12:00 PM on November 10, 2016, the potential winner will be selected from all eligible Entries received in a random drawing conducted by an SAP representative whose determinations are final and binding. Odds of winning depend on the total number of eligible Entries received during the Sweepstakes Entry Period. (6) PRIZES & CORRESPONDING APPROXIMATE RETAIL VALUE (“ARV”): One (1) total prize will be awarded. 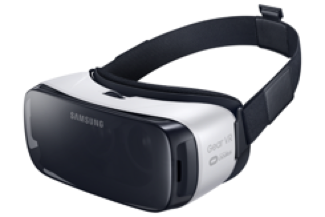 One (1) Samsung Gear VR headset with an approximate retail value (“ARV”) of $100 USD. Prize is not redeemable for cash or transferable; prize may not be sold or transferred for commercial use. No substitution allowed except that Sponsor may, at its sole discretion, substitute a prize with another of equal or greater value. All taxes are solely the responsibility of the winner. Each prize is non-transferable, non-returnable and not redeemable for cash. No prize substitutions are permitted. Winners may be required to furnish his/her social security number for the sole purpose of preparation of any tax forms as required by law. Except where prohibited by law, entry and acceptance of prize constitute permission for Sponsor to use each winner’s name, prize won, hometown, likeness, photographs, and statements for purposes of advertising, promotion and publicity (including online posting) in any and all media now or hereafter known throughout the world in perpetuity, without additional compensation, notification or permission. (7) LIMITATIONS: In event of a dispute regarding the identity of the person submitting an Entry via RT on Twitter, the Entry will be deemed to be submitted by the natural person who is the “authorized account holder” assigned to the Account by Twitter. Entries by any method other than set forth above in Section 4 are void. Use of any automated system to enter as determined by Sponsor in its sole judgment is prohibited and will result in disqualification at Sponsor’s sole discretion. Sponsor and any of its officers, directors, shareholders, employees, agents or representatives (individually and collectively, “Releasees”) are not responsible for Entries from ineligible persons, or Entries that are altered, delayed, deleted, forged, fraudulent, illegible, improperly accessed, inaccurate, interrupted, lost, misdirected, tampered with, unauthorized, or otherwise not in compliance with these Official Rules; or for lost, interrupted or unavailable network, server or other connections; technical failures of any sort; unauthorized human intervention; traffic congestion; or other errors of any kind, whether due to electronic, human, mechanical, printing, production or technical errors or other causes; even if caused by the negligence of any of the Releases. (8) WINNER NOTIFICATION: The potential winner will be notified by email on or about 1pm on November 10, 2016. The Sponsor is not responsible for changes to a potential winner’s email function that may interfere with winner notification. To claim prize, each potential winner will be required to provide his or her email address. At the sole discretion of the Sponsor, disqualification, forfeiture and the selection of an alternate winner may result from any of the following:  potential winner’s failure to respond to notification within one (1) hour after its transmission;  the failure of notification due to deactivation of the potential winner’s Account prior to receipt of notification;  potential winner’s failure to become a follower of @SAPAnalytics, resulting in the potential winner’s failure to receive a Direct Message from Sponsor;  potential winner’s Account “protected mode” is set so that the potential winner’s updates/responses may not be visible to Sponsor;  potential winner’s failure to provide Sponsor with satisfactory proof of age, identity and residency;  potential winner’s failure to validly claim the prizes by deadline date, and  any other non-compliance with these Official Rules. In the event of a prize is forfeited, the Sponsor may, in its sole discretion, award or not award the forfeited prize to an alternate winner. (9) CONDITIONS : By entering this Sweepstakes and/or accepting any prize you may win, you agree, represent and warrant that:  you will be bound by the Official Rules and the Sponsor’s decisions, which shall be final in all respects; you will comply with all applicable federal, state, and local laws and regulations in connection with your participation in the Sweepstakes without limiting your obligations under the prior section , immediately above, you will comply with any laws or regulations regarding disclosure of endorsements, sponsorships and other payments from online endorsers, including bloggers, in connection with any such activities or communications related to Sponsor and these Sweepstakes;  Entries become solely the Sponsor’s property and will not be acknowledged or returned;  you release and hold harmless the Releasees from any and all liability for claims, injuries, losses or damages of any kind, including without limitation, death and bodily injury, resulting, in whole or in part, directly or indirectly, from the awarding, delivery, acceptance, use, misuse, possession, loss or misdirection of any prize; participation in the Sweepstakes or any Sweepstakes-related activity or travel or from any interaction with, or downloading of, computer Sweepstakes information;  the Releasees do not make any representation, warranty or guarantee, express or implied, relating to the Sweepstakes or the prize; winner’s acceptance of prize constitutes the grant to Sponsor and assigns of an unconditional right to use winner’s name, address (city and state only), voice, likeness, photograph, biographical and prize information, statements about the promotion and/or live and taped performances of interviews for any programming, publicity, advertising and promotional purposes without additional compensation, except where prohibited by law;  in the event viruses, bugs, unauthorized human intervention, Acts of God, acts or regulations of any governmental or supra-national authority, war, national emergency, accident, fire, riot, strikes, lock-outs, industrial disputes, acts of terrorism or other matters beyond the Sponsor’s reasonable control, corrupt, prevent or impair the administration, security, fairness or proper play of the Sweepstakes, so that it cannot be conducted as originally planned, Sponsor has the right, in its sole discretion, to cancel, terminate or suspend the Sweepstakes; and in such event, to select winner(s) by such method as Sponsor in its sole discretion shall consider equitable;  the Releasees are not responsible for typographical or other errors in the offer or administration of this Sweepstakes, including but not limited to: errors in the advertising, Official Rules, selection and announcement of the winner and prize distribution;  the Releasees are not responsible for any inability of a winner to accept or use the prize (or any portion thereof) for any reason;  Sponsor has the right to modify prize award procedures at its sole discretion;  the Releasees are not responsible for changes to any Twitter function that may interfere with Sweepstakes or your ability to timely enter;  Releasees are not responsible for any failure of delivery of winner notification; and  you agree that any and all disputes, claims and causes of action arising out of, or connected with, the Sweepstakes or any prize awarded shall be resolved individually, without resort to any form of class action. All issues and questions concerning the construction, validity, interpretation and enforceability of these Official Rules, your rights and obligations, or the rights and obligations of the Sponsor in connection with the Sweepstakes, shall be governed by, and construed in accordance with, the laws of England and Wales, without giving effect to any choice of law or conflict of law rules, which would cause the application of the laws of any other jurisdiction.